Web development has seen many changes in the recent years. Some of the technologies had completely revolutionized this process. Prominent among them is the use of content management systems (CMS). These systems provide a core engine on which a site runs giving an easy-to-use interface for web administrators. No coding from scratch is required that significantly eases the setup and configuring task. Just install a CMS and your site is up and running in a few minutes. All these CMS flavors are continuously updated and improved to give you the very best features to better manage your website. All of these content management systems can be installed on almost all web server configurations currently supported by popular web hosting companies. I've used several of these CMS for some of my clients and found them very flexible and user-friendly out-of-the-box. Some of these excellent CMS solutions can be easily used for creating a full-fledged and feature packed eCommerce portal for professional websites. 1. SilverStripe: This promising open source content management system is ideal both for developers as well as for the general users. It has a user-friendly dashboard that enables you to quickly create a website with minimum efforts. It has a large community of users and developers to help technically challenged. With a large collection of add-ons, one can easily extend and incorporate new features on a website. It also has one of the best and comprehensive documentation systems which eases the learning curve by many folds. You can either host this CMS on your own web server or can opt for a premium hosted solution. Its framework is made for advanced users giving complete control over the markup and code. 2. Drupal: It's a popular and powerful content management system used by millions of users including large and medium-sized businesses. One can use it to create almost any type of website with custom features and functionalities. Its PHP-powered core engine includes all the major features of a CMS. It has good localization support to facilitate the easy creation of multilingual websites. Similarly, a large collection of themes developed by the community ensures you can find the best one matching with your design preferences. With drag and drop functionality, almost everyone can make changes to the website right from within the CMS dashboard. Its flexible system of hooks and callbacks is made for power users. 3. Joomla! : This is yet another highly popular content management system with millions of installations across the globe. It's quite user-friendly and offers large collections of themes. Similarly, tons of plugins ensure easy addition of new features to the website. I've used it for several clients without any issues. It can be used for building regular websites, blogs, and forums too. Making multilingual websites through Joomla is a breeze. It can be easily installed on different types of popular server configurations. It's actively developed and is updated with new features. It is one of the select content management systems with an easy migration process enabling easy transfer from one web server to another one. 4. Plone CMS: This powerful CMS can be easily connected with external business applications like a CRM. Its built-in content version control and locking mechanism gives you complete control over the publishing workflow. It has one of the largest repositories of add-ons for added features and functions. It also has caching and localization support to create blazing fast multilingual websites. With clustering support, a high traffic business portal can be split into multiple servers to handle massive spikes of inbound traffic. Its advanced search can also find out information from PDF and Word documents uploaded to the server. One can also easily create secure multisite networks through this flexible CMS. 5. TYPO3: Do try this excellent content management system if you're planning to build a sparkling business website. It is secure, easy-to-use, and works like charm. It uses modern web design standards and works on all devices rendering responsive layouts out-of-the-box. Do try it once on your server. Multisite management is also quite simple through a clean and clutter-free dashboard. Content and media can be uploaded almost anywhere (local or a remote cloud) without affecting the performance of the website. It has cutting edge front-end content editing functions to quickly design and edit a website. With easy template system and automated caching mechanism, your website rocks from the beginning. 6. MODX: This flexible content management system can be used to create both a simple website as well as for a large business portal. It can deliver responsive modern designs that perform seamlessly on almost every device. Its website manager is built for simplicity which is ideal for technically challenged. Power users can use its API to build custom administration interface making site management quite easy for the end user. It automatically keeps track of dependencies making site migration, a cake walk. The new custom features are implemented in such a way to keep the upgrade path conflict-free and free from any changes to the core. High traffic websites can run on multiple servers and database instances. 7. Pagekit: This light yet feature-packed CMS is ideal for building blogs and small to medium websites. It can be easily installed on a typical web server in a few easy steps. It has one of the easiest dashboards free from any clutter allowing you to completely focus on website's design and easy content creation. With a simple drag and drop interface, one can easily build menus, edit pages and manage different types of widgets. Administrators can also view real-time visitor stats as well as can pull Google analytics data right within the dashboard. It has a fully-featured blog module to easily create one in no time. Advanced users can easily manage and administer a website through powerful command line directives. 8. concrete5 CMS: As the name suggests, this robust, powerful and user-friendly content management system is an ideal choice for professionals to make a business website. It has a WYSIWYG content editor that lets you preview the copy before it is published on the site. I liked its theme customization controls. One can also create surveys on the website through this CMS which are completely responsive. Complete blog features are supported out-of-the-box to integrate one with the primary site. With granular access controls, webmasters can assign permissions for content and users as per the requirements. It has built-in SEO features and also provides key social media integrations for easy content sharing by visitors. 9. Umbraco: This is one of the few content management systems which has detailed documentation both for developers as well as for general users. It allows you to define custom content types before you build a brand new website. Its media manager enables you to control a large archive of rich media content. It has several service API sets enabling developers to customize the website at their will. Web forms can also be created and customized in an easy way through this CMS. Event subscription feature also enables site owners to run custom code, whenever required. The installation procedure for this CMS is quite simple and one can use different types of SQL variants for powering this content management system. 10. Contao: The LTS versions of this impressive content management system provides update and support for up to 4 years. It is actively developed and is regularly updated. It's search engine friendly and works on all devices without any hassle. Its easy installation process can be followed by almost anyone. Multiple sites can be managed through API functions in a seamless and automated way. Through a large collection of extensions, one can also integrate advanced features within websites. It also facilitates a design of professional grade newsletters for website subscribers. Businesses looking to create an eCommerce shop can also use this content management system. Do once give this excellent CMS, a try. 11. Subrion: This CMS has one of the best administration interfaces with user-friendly controls and prompts. Its WYSIWYG editors makes content publishing process, a breeze. Advanced users can use its framework API to make custom extensions. All the core SEO features are baked right into the CMS. It also has an advanced access control system with a full-fledged user management interface making it an ideal choice for making a large website having multiple users with different roles and privileges. Users are relieved from the manual update process and both major and minor versions are applied automatically in the background. If you're planning to sell something on a website, use its handy payment system. 12. Fork: The light and impressive interface of this content management system is loved by every new user. It has a large collection of apps that can be integrated with it for added features. Similarly, a big collection of themes ensures you can get the right kind of custom design you're looking for the website. It provides seamless integrations with marketing and analytics tools to ensure you get more out of your business website right from the day one. And, like any other good content management system, this one also supports all the core SEO features for making your website search engine friendly. 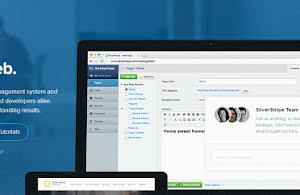 It also has a large and active community new users can take advantage of to quickly learn and use this excellent CMS. 13. ProcessWire: This is one of the fastest content management systems which can scale to the maximum while running a large scale business website. It has a powerful API which can be easily used by developers to extend and customize the core. This CMS also consumes very less system resources. The CMS itself can be easily extended and enriched through modules. Its user-friendly dashboard can also be customized to match your workflow. It has a robust and secure user management system which enables a team to run and manage a large business website. It also has a large and active community of users which can be easily leveraged to master this flexible content management system. 14. BackBee: This free and open source content management system deserves a mention in this list. It has a drag and drop functionality which makes content creation and site management, quite easy. It also has dynamic extensions which can be used to add new features and functions within the CMS, on the fly. Its design editor is one of the most flexible solutions which is liked alike by professionals as well as by the technically challenged. Article publishing can also be scheduled through it, which ensures the website is updated on an automated basis at the desired intervals. Its search module auto-completes the queries and highlights the search term across the entire website to enable easy scanning of content. 15. Wagtail: This intuitive and unique content management system incorporates some of the best features to easily build and maintain a website. A collection of premade content blocks enables the designer to quickly fill the page layout with the desired fields and options within different sections. Through snippets, the same piece of web content can be easily integrated into multiple places through the website. Its site-wide search engine is quite powerful and is deeply integrated with the core to give you the best results. Through a simple navigation interface, traversing a large collection of content and pages is dead simple. It also has one of the most advanced image cropping utilities easing image management. 16. CouchCMS: This feature-rich content management system is a promising candidate to power your business website. It can easily create editable regions on the website simply by surrounding select HTML code by special tags. Page cloning is easy through it speeding up the development time by many folds. Both a regular website as well as a blog can be created through this CMS. Portfolio galleries can also be created through this powerful content management system. Creating SEO-friendly permalinks is also quite easy making your website search engine friendly to attract organic traffic. For a typical eCommerce website, one can also integrate PayPal payment system in a few easy steps to sell services or digital items. 17. Symphony: This standards complaint content management system is a must try for every website owner looking for a stable and feature-packed solution. Its modular architecture ensure you can customize it at will without affecting the other parts keeping the site free from any inadvertent changes. Developers can create custom content blocks from scratch enabling a complete custom build powering the website foundation. Its XML-driven data engine allows developers to create custom integrations and modules to power website features and functions. Complete control over the permalink structure ensures you get the right kind of URL structure as desired by the project. A library of extensions is also available. 18. SageFrame: This full-fledged content management framework includes tons of impressive features to build a website. Its powerful visual layout editor enables even a layman to create an impressive page structure in no time. Similarly, inline editing allows changes of the design right from the front-end. This is one of the few CMS solutions where modules itself can be managed and arranged through a drag and drop functionality. Its flexible and rich dashboard can also be customized as per the requirements. Its single-click installation process makes it a choice for novices as well. Website cache management can be done at a granular level right from the dashboard making your site accessible throughout the globe. 19. Bolt: If you're going to use this content management system for your website, you'll be pleased with the user-friendly features it has on offer. Content changelog enables administrators to keep an eye on all the changes made by different users. All the custom-designed CMS templates are powered by Twig. It also supports custom taxonomies out-of-the-box to create unique content types and entities. It can be installed both from a command line as well as from a regular web interface. Through extensions, you can create custom web forms which can be easily integrated with the website. Businesses can also do custom branding of the CMS both at the front-end as well as at the backend for a truly personalized experience. 20. BigTree CMS: Like every professional content management system, this one also has a flexible and powerful API to customize and extend the platform with ease. Its light core and inbuilt caching system can handle very large spikes of traffic. Assets minification and caching is also available for the site. Its rich media management system is impeccable with custom image cropping and retina image support. Through its integrated analytics system, one can easily keep watch on the traffic statistics without relying on an external solution. The front-end toolbar facilitates easy modification of the design template directly on the live web page. Page versioning ensures you can revert to the older page copy with ease.